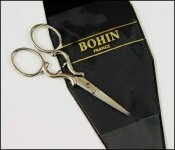 Bohin Coeur Embroidery Scissors  - $18.04 : Yarn Tree, Your wholesale source for cross stitch supplies. Item 4299. Coeur (Heart) Embroidery Scissors. A fanciful heart embellishes these scissors when closed. Very sharp precision points for fine needlework. 3¾” long. Style 24311. Comes with a protective display sleeve. From Bohin France.